Saying goodbye from a state of peace, harmony, balance, and love. The decision to euthanize an animal is never an easy one for a human to make. When I was ready, Nedda compassionately helped me move into spirit. I asked her to share our story with others so that humans will learn that death is not to be feared, but is just another aspect of our adventures together. 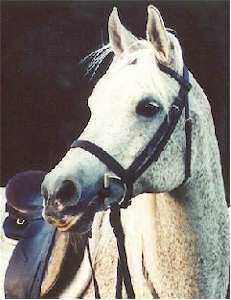 Echo was a flea-bitten gray Arabian mare, with brown speckles everywhere and crystal clear hairs in her mane and tail. We met in October, 1976, when she was a broodmare on an Arabian farm in New York State. A beginner at riding doesn't usually start out with a novice horse, but I fell in love at first sight of her. Somehow, over the years, we learned how to have great times and not get in trouble. We enjoyed trail riding and had fun doing dressage, too. 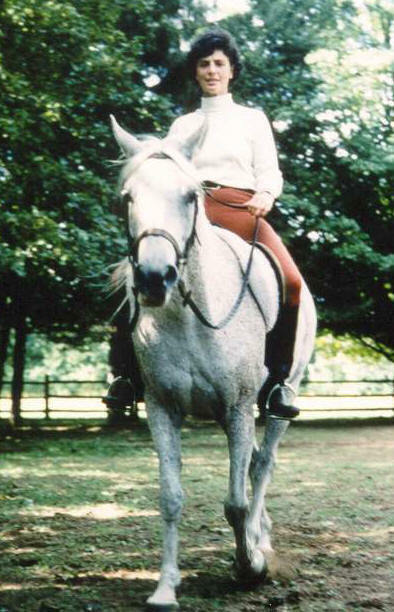 Echo loved to be ridden, to gallop across fields, and to jump logs. She was always as eager for my companionship as I was for hers. In October, 1998, Echo was nearly 32 years old. After a summer of dry weather, heavy rain was predicted for the next several days. That afternoon, I discovered Echo in a panicked state galloping in her turnout. She was breathing hard and sweaty under her winter coat. I walked her out and thought about how difficult the coming winter would be for her. For the previous six months, she often stumbled on smooth ground. She was unable to stay warm if she was slightly damp and the temperature was less than 75 degrees. Confinement in a stall for any length of time caused her legs to fill up with fluid. Echo would be very sore tomorrow and would be confined to her stall for nearly 5 days due to the gold rainy weather. The nutritional supplements which reduced her pain and inflammation would not be enough. I gave her some bute paste, an anti-inflammatory, and left her in her stall. The next morning, it was pouring rain. Echo was in the barn and very uncomfortable. I gave her more bute. An hour later, I returned to increase the dosage. I was often aware of Echo's physical needs without consciously asking her about them. I would just "know" what she needed, just as I had known this day that she was in too much physical pain. As I left the barn, I realized that Echo might very likely need constant drugs from now on to be physically comfortable. I suddenly suspected she might be ready to leave her body. For more than a week now, when I would ask about her transition, she had said "very soon". The word "very" was new in her answers. I had to find out what she wanted to do. I also wanted to be sure my own feelings didn't interfere with my telepathic reception. At home, I prepared for sacred ceremony. I used Reiki symbols and sage to prepare myself and a sacred space. I then used a rattle and a mantra to center myself. I invited all the beings of spirit who work with Echo and me to be present. Then I spoke with Echo. She told me that it was time for her to leave, that she was ready, and that she would need help. I could feel in my own body that this was true, and all my guides confirmed it. As I made the arrangements that day, I became more and more certain that I was doing what Echo wanted. This certainty was a physical sensation, deep in my gut. It got stronger and stronger as I made the arrangements for euthanasia. A personal friend, who is also our veterinarian, would do the task. I called or e-mailed Echo's and my friends to let them know and to give them an opportunity to say goodbye. I invited a very few people to be present for this sacred moment. I told Echo about the plans I had made for her. At 7 p.m. the next evening, Echo and I, our veterinarian, and two friends, Addy, and Kate, walked with flashlights through horse paddocks and pastures until we stood under a large tree near the center of the farm. The rain had stopped, but the air was damp and sky was overcast. When we reached the chosen spot, Echo stood quietly and did not even try to graze. The vet began injecting a large syringe full of euthanasia drugs into her jugular vein. Before the injection was completed, Echo went down slowly onto her right side. Addy put her arm around me for support. I was still holding the 8-foot lead. We were all startled when Echo's legs began moving. Lying on her side, she was literally galloping, her right feet cutting into the Earth. She ran and ran and ran and ran, like she was headed down a runway, taking off for her flight into spirit. After what seemed like a long while, her legs stopped moving. The vet knelt behind Echo's head and finished the injection. We all waited quietly for Echo to complete her transition. Her breaths were long and relaxed, with long pauses every third breath or so. The vet kept trying to close Echo's eyes. Echo kept opening them. Echo was still with us and was taking her time leaving. After awhile, the vet decided to give Echo more drugs. This meant a long walk back to her van near the barn. Addy went along to show her the way, as it had become quite dark. Meanwhile, Kate and I checked Echo energy field. We could feel that her spirit was no longer in her feet or legs or the lower half of her torso. In the upper half of her body her energy was still strongly present. When Addy and the veterinarian returned, Echo received another a huge dose of tranquilizer. We all expected her to expire quickly. Instead, she began snoring, gentle little snores at the end of each exhalation. The vet shook her head in disbelief and dismay. "I've given that horse enough to kill two elephants," she said, finally. She left for her office to get more drugs. Again, Kate and I checked Echo's energy. Her spiritual essence had withdrawn all the way into her spine. Only the crown chakra was wide open. It appeared that when she was ready, Echo would leave through the highest spiritual center of the body. Meanwhile, the first and second chakras felt "stuck". I put some Reiki symbols into them with the intention to help the process. Kate also did energy work to help Echo move on. Echo remained in charge and clearly was taking her time. We turned off the flashlights and sat quietly on the damp earth. There was enough light in the sky from Granby and Hartford to see, once our eyes adjusted to the dimness. It was cool, but not uncomfortable. Ironically, I was having my one unfulfilled dream come true, sitting on the ground next to Echo while she lay beside me, stroking her and talking to her. Kate and I agreed that Echo was teaching all of us about the process of death and what we can and cannot control for another. I felt very peaceful, serene and uplifted. It was a very precious moment. Echo was not in any distress or pain. It was beautiful. It was perfection. I felt God's Grace all around us. Finally the vet returned with a 6-inch long needle and a small vial. She explained that this drug stops the breath. She injected it directly into Echo's heart. In less than two minutes, Echo stopped breathing. Kate and I could feel that her spirit had left her body. My veterinarian friend was very relieved. She had hoped this process would be over quickly to protect me from the pain she knew I would feel. Now that it was over, she bent down and kissed Echo good-bye on the forehead. "Did you put perfume on her?" she asked, lifting her head as if startled. I leaned over Echo's forehead, kissed her and sniffed. I smiled to myself. A wonderful, indescribable fragrance was present. It was very light, faintly hinting of sweetness and flowers, but was unlike any Earthly bloom. I recognized it. It was the aroma of Echo's essence, of her true Self. I invited Kate and Addy to smell it, too. The great spiritual masters of India, the Holy Ones, have often been described as having incredibly beautiful aromas coming from their bodies even when sitting on garbage heaps. And like these holy beings, Echo had left her body through the highest spiritual center of the body. Three days later, while I lay on the floor with my cat companion, Violet, sitting atop my stomach, Echo arrived in full spirit form to reunite with me. Her energy was palpable. She was larger than her physical body, and had enormous wings. She barely fit into my small healing room. Mentally I threw my arms around her neck, as I had done so many times when she was alive. She wrapped her wings about me in a huge, tender hug. We merged completely into love. Echo lived her entire life without ever hurting anyone. She was gentle and kind, not knowing how to defend herself against the aggression of other horses. Small animals (mostly cats) shared her stall, safely sleeping in her hay while she ate and moved around them. Humans who feared horses were rarely afraid in her presence. Children always wanted to touch her. Echo was also spirited and energetic, full of life, love, humor and joy. She was a great friend, companion, and teacher. Even in her transition, she taught us all with love. Echo lives on in spirit. She is available to me whenever I ask, and comes to visit often even when I don't ask. Many people tell me they can sense her presence throughout my home. She continues to teach in my workshops and to help sometimes with clients. I am grateful for the blessing of her presence in my life.